Things have been busy, buzzing like a bee, hovering over a full Spring bloom. Not too much time in the kitchen for me this week, so I share with you my sisters work this week. She had a catering job, to prepare a birthday cake. The order was for one of her whispering blow away sponges. Now my mum is a champion sponge maker diva, and she’s passed on her secrets to us, although truth be it that I’ve never tackled one myself..not to disappoint! So I’ll just keep the secret onboard until I make one! 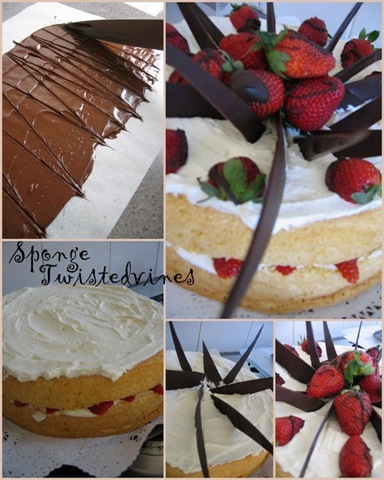 What better way than to serve Sponge, filled with strawberry jam, fresh chocolate coated strawberries and fresh cream. Prepared for 1 x 28cm round tin with high sides or 2 x 20cm round tins with high sides. Grease tins of your choice with butter. Beat whites of eggs with salt. Add sugar gradually. Add yolks, beat till creamy. Sift cornflour, custard powder, cream of tartar and bicarbonate soda 3 or 4 times, and at a high elevated level. (Hold sifter at about 30cm high from paper on bench to aerate flours). Fold sifted ingredients into mixture. Add boiling water. Bake 20 minutes in a moderate –hot oven. The success of this recipe depends on the sifting of flours, and the oven temperature. Oven must never be below moderate heat. 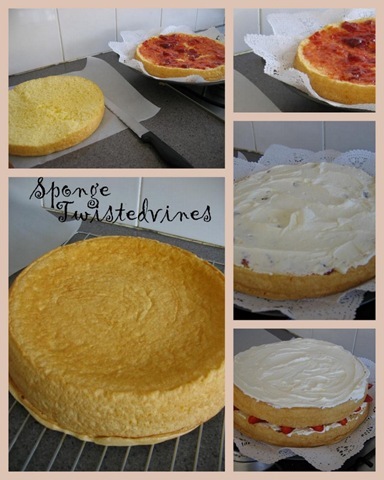 Serve suggestion: Cut the sponge in half, spreading strawberry jam, cream and fresh strawberries in centre. 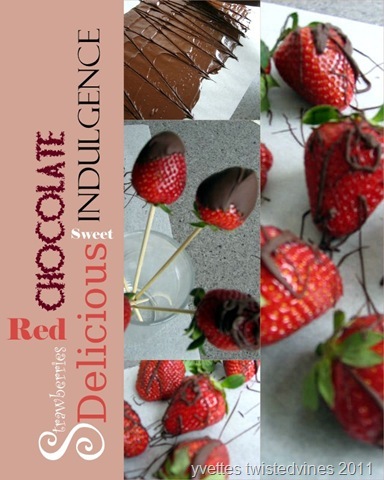 Place the other half on top, spreading fresh cream and placing chards of chocolate and chocolate coated strawberries on top. Magical for a special occasion, and wishing you all the success in making this blow away sponge. 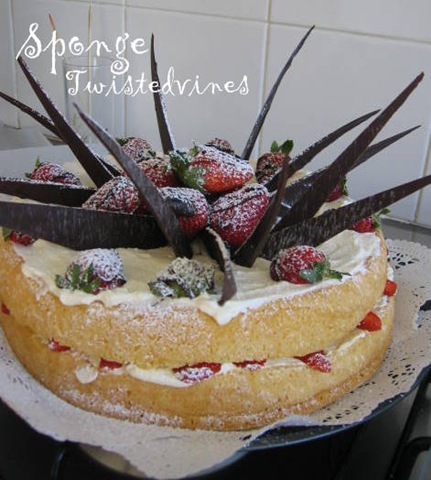 You’ll blow them away with how light and fluffy you sponge has turned out!. That is one beautiful cake, Yvette! I’ve never attempted baking a sponge cake but if I thought I could make one like this, I’d be sifting flour right now. Thanks for sharing! Yvette, I agree, this is a most beautiful cake, and sounds absolutely delizioso!! Tell your sister she has done beautifully, and your photos are wonderful. I would love to try this for a special occasion. Yvette, how very special for you to share your Mom’s recipe with us all – I feel very honoured and will hold onto this recipe for a very special occasion! I love that it uses custard powder. Your sister’s order is exquisite! Kudos on a job well done. I love the cake.. gorgeous and looks absolutely delicious. But you know when I saw that chocolate my mouth started to water lol. Love chocolate covered strawberries. Wow, what a cake Yvette! Your mom’s recipe is great. I wouldn’t want to get too close to the cake though for fear of getting jabbed. 😉 Looks gorgeous. Those shards of chocolate look amazing on the cake. your cake looks scumptious, and I envy those that produce such amazing results as I love desert. Previous PostA trail of Inspiration. Next PostI’m free to fly….